It is off season for skiing and I am still in rehabilitation for back spasms so the only tennis I am into is hitting a few balls with my devoted wife, Nancy. With the upswing in my status, I decided to take a neighborhood walk. It is a beautiful blue sky day with a warming sun and a gentle breeze. Rather than cranking up tunes or a radio station on my smart phone, I decided to concentrate on my surroundings. 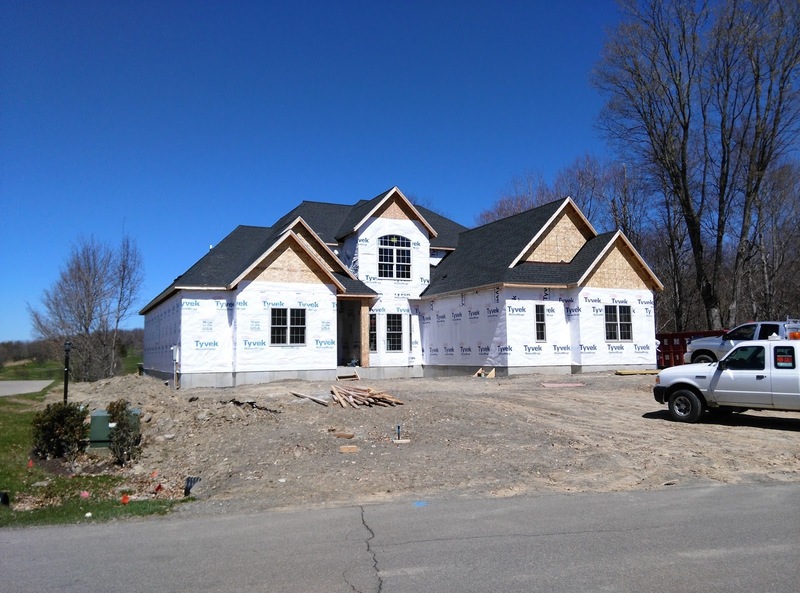 Over the past several months starting last fall of 2015 two new homes have been under construction in our area. My natural curiosity about construction requires me to periodically observe progress. So my destinations today on my walk were to check on the status of each new home. One home is nearing completion. Although I was not able to view the inside, I suspect things are nearing completion. Outside the forms are set for the sidewalk from the driveway to front door. Rather than strict rectangular shape, there is some curving of the walk. A bit more aesthetic that just plain old straight lines. After walking up the hill to the more elite section of our neighborhood I passed by a much more elaborate house sheathed in tyvek and is soon to have siding installed. Several workmen and their trucks were present discussing the project. This particular house probably would have a certain grandeur if there was a more spacious siting. As I have observed this house rise from a hole in the ground to the present state, I have been struck how this home seems to overwhelm the home next door. Perhaps after landscaping is finished the new structure will fit into the existing scene. Meanwhile, I will keep passing by on my walks and enjoy seeing a project go to completion. The engineer in me is easily entertained.